Former Islamic minister Dr Abdul Majeed Abdul Bari has rejoined the Adhaalath Party. According to local media, Bari signed for Adhaalath Party on Monday, but the religious scholar has not publicly spoken about the move. Bari served as Islamic minister under former President Mohamed Nasheed. He left the Adhaalath Party in June 2013 and signed for the main opposition Maldivian Democratic Party (MDP) ahead of the presidential election in November 2013. Following the imprisonment of former President Nasheed in March, the Adhaalath Party formed an alliance with the MDP and launched anti-government protests under the ‘Maldivians against tyranny’ banner. 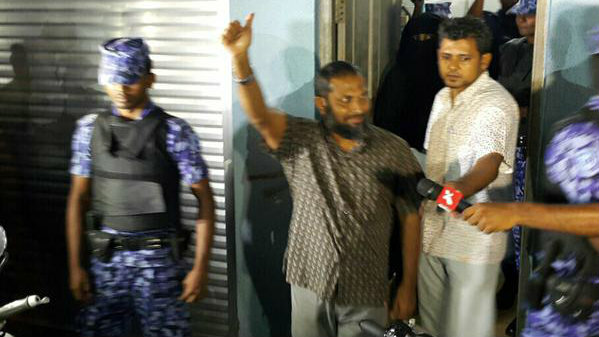 The Adhaalath Party leader, Sheikh Imran Abdulla, remains meanwhile under police custody. He was charged with terrorism and accused of inciting violence at a mass protest on May 1. Bari has also been active in the opposition alliance. The High Court has rejected an appeal challenging the criminal court’s decision to hold Adhaalath Party president Sheikh Imran Abdulla in police custody until the conclusion of his trial on terrorism charges. The High Court reportedly informed Imran’s lawyers last week that the appellate court could not review decisions of judges to hold defendants in custody for the duration of a trial. Imran’s lawyer Husnu Suood told local media today that the High Court’s decision not to accept the case will be appealed at the Supreme Court. The religious conservative party’s leader is accused of inciting violence at a mass anti-government protest on May 1. The criminal court ordered police to hold the opposition politician in custody pending the outcome of the trial. He has pleaded not guilty to the charges. The trial has been stalled after two of the three judges were promoted to the High Court on June 8. The Adhaalath Party has meanwhile said that Imran’s health is worsening under police custody. Imran is being held at the police detention centre on Dhoonidhoo island. The Adhaalath Party said in a statement today that Imran has diabetes and high blood pressure. Tests conducted after his arrest show high blood pressure and cholesterol levels as well as high urine acidity, the party said. He has been brought to Malé several times to consult specialist doctors. The Maldivian Democratic Party (MDP) has vowed to continue protests until the opposition’s demands to release “political prisoners” are met after police cracked down on last night’s sit-in protest. Some 12 protesters, including former ruling party MP Ahmed Mahloof and Adhaalath Party deputy secretary general Ahmed Shareef, were arrested from the protest. The MDP had said the sit-in on Malé main thoroughfare Majeedhee Magu could last three days. MDP vice president Mohamed Shifaz told Minivan News today that the party organised the protest because President Abdulla Yameen’s administration was not heeding the opposition’s demands despite two previous mass protests. “We will continue protesting till our demands are heard by the government. The purpose of our protest was to call to end to government tyranny. So we will protest till our purpose has been achieved,” he said. Riot police dispersed the crowd of around 2,000 protesters after 12:00am last night. The police had declared the protest was not peaceful after organisers refused to stop using loudspeakers after 11:00pm. Specialist Operations (SO) police officers chased protesters into side streets and cleared Majeedhee Magu, but protesters regrouped and continued protesting after 3:00am. The protest ended after MP Mahloof and several others were arrested. “Official estimates of less than 2000 [people] took part in the latest [demonstration]. A clear message to the opposition that their lies have failed them,” tweeted housing Dr Mohamed Muiz. Progressive Party of Maldives (PPM) MP Riyaz Rasheed announced that a fireworks display will take place tonight to celebrate the “MDP’s weakening” and the opening of two futsal pitches in Thaa atoll. The government also held a fireworks display to celebrate the “failure” of the May Day mass anti-government demonstration. PPM MP Nihan meanwhile suggested that opposition supporters from other islands had accepted Riyaz’s advice and decided not to travel to the capital for the June 12 protest. Riyaz’s tweets about not allowing “islanders” to come and protest in Malé stirred controversy last month. The June 12 demonstration was the third mass protest calling for the release of imprisoned former President Mohamed Nasheed and former defence minister Mohamed Nazim, whose arrests in February triggered the ongoing political crisis. The turnout at last night’s protest was significantly lower than the mass protests on February 27 and May 1. Some 20,000 people took to the streets on May Day and nearly 200 protesters were arrested in a police crackdown after protesters attempted to enter Malé’s restricted Republic Square. The opposition is also demanding the withdrawal of terrorism charges against Adhaalath Party president Sheikh Imran Abdulla, Jumhooree Party (JP) deputy Ameen Ibrahim, and JP council member Sobah Rasheed. All three were arrested after the May Day protest and accused of inciting violence. Meanwhile, despite JP leader Gasim Ibrahim’s tweets last night distancing the party from the sit-in protest, Shifaz said that the JP’s level of support and cooperation for the opposition ‘Maldivians against tyranny’ campaign remains unchanged. 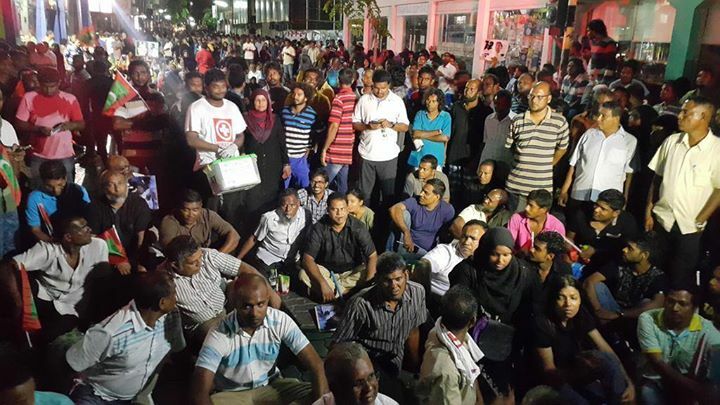 JP MP Ali Hussain and some senior members participated in last night’s protest. Gasim has been out of the country since late April while Ameen and Sobah left shortly after their release from remand detention. In a video message this week, Sobah said he is seeking political asylum. President Yameen had called for separate talks with the three allied opposition parties after the May Day protest, but ruled out negotiations over the release of Nasheed and Nazim. Talks with the JP began last week while the government rejected Nasheed and Imran, respectively, as the MDP and AP’s representatives. “Many opposition politicians, including most of the JP leadership, have fled abroad to avoid arrest and the likelihood of a biased and politically-motived trial,” the statement added. Ameen posted a video message on YouTube last night declaring solidarity with the opposition protesters. “Rule of law has been abandoned in Maldives and we are now governed by rule by law,” MDP parliamentary group leader Ibrahim Mohamed Solih said in the statement. 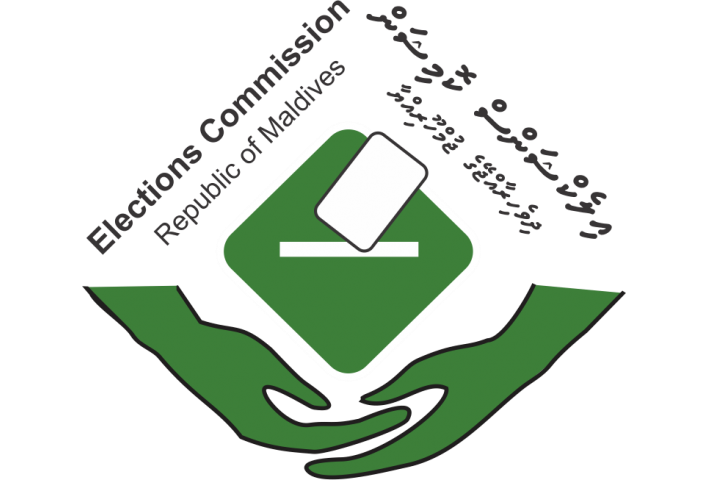 The Elections Commission has delayed disbursing funds allocated for political parties in the 2015 state budget due to a delay in verifying the exact number of members in each political party. A former MP for the main opposition Maldivian Democratic Party (MDP), Ahmed Thasmeen Ali, has alleged the commission is delaying funds to obstruct political party activities. The MDP, the Adhaalath Party and members of the Jumhooree Party have launched an antigovernment campaign over the imprisonment of ex-president Mohamed Nasheed and ex-defence minister Mohamed Nazim. 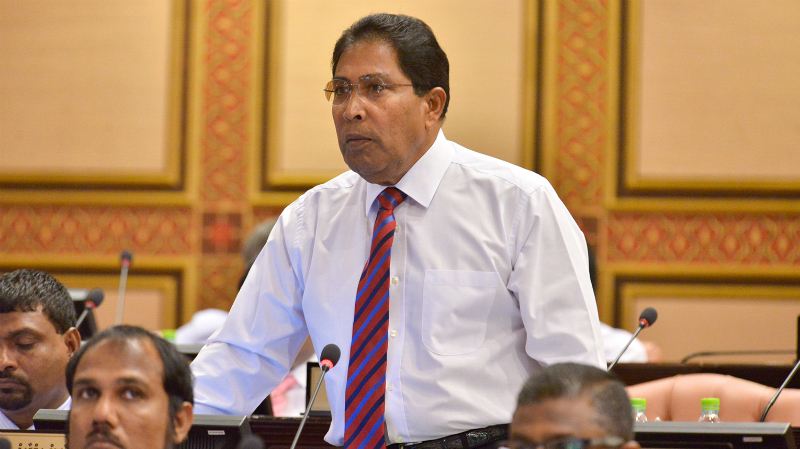 Some MVR19million (US$1.2million) has been allocated for political parties in the 2015 budget. The 2013 Political Party Act states the state must allocate 0.1 – 0.2 percent of the budget for political parties. Funds must be disbursed within the first three months of the year according to the number of members in each party. The parties must submit an annual report and an audit report before funds can be disbursed. A spokesperson for the Elections Commission denied Thasmeen’s allegations and said the deadline for disbursing funds and the deadline for submitting the required documents to the commission fall on the same date. “There was a delay in the verification of members of political parties as per the numbers stated in their annual reports. But we are now in the process of handing out the funds,” media officer, Fazla Ahmed said. There are 15 parties registered in the Maldives. Many are dysfunctional. The commission in March fined the MDP and the opposition Adhaalath Party by MVR47,000 and MVR33,000 respectively on the charge of inciting violence in their then-daily protests. The two parties have refused to pay the fines and asked the commission to review its decision. Fazla said today it has not made a decision on the appeal yet. The commission is authorized to deduct the sums from the annual payouts. The commission has ruled a second mass protest by the opposition on May Day unlawful. The criminal court has released Adhaalath Party (AP) president Sheikh Imran Abdulla from police custody with a ban on traveling overseas for one-month. Imran was arrested from the mass anti-government protest on May 1 and accused of encouraging violence. The criminal court had extended Imran’s remand detention twice, but ordered his release today with the last 10-day period due to expire tonight. Speaking to the press upon his release from police custody, Imran said the May Day protest was a success because it had “forced” President Abdulla Yameen to initiate talks with the opposition. “It was really because of the people who went to jail with us that we have achieved one of our main demands. The government was forced to come to the discussion table with political parties because of the large number of people who were there for the May 1 protest,” Imran said. If the government is sincere, the allied opposition parties are ready to engage in dialogue to resolve the political crisis, he said. Imran denied allegations inciting violence during his speeches on May 1, which police contend led to protesters assaulting police officers, damaging property, and disrupting public order and safety. “I have never encouraged anyone to create unrest, fear, harm anyone, at any time,” he said. The police have forwarded cases against Imran, along with main opposition Maldivian Democratic Party chairperson Ali Waheed and Jumhooree Party deputy leader Ameen Ibrahim, for prosecution on charges of threatening and inciting violence. Prior to Imran’s release, the president’s office reportedly rejected Imran as a representative of the AP for official talks with the government saying he was under police custody. Muaz declined to comment on whether the government would accept Imran as a representative for the talks following his release. Hours before Imran’s release, the high court overturned the criminal court’s May 17 ruling to keep Imran in police custody for 10 days. The appellate court transferred Imran to house-arrest. In a ruling this afternoon, judges noted that Imran has diabetes and that tests conducted following his arrest showed high levels of blood pressure, cholesterol, and urine acidity. Imran’s lawyer, Ali Zahir, told local media that criminal court judge Ali Sameer had considered the high court ruling before releasing the AP leader. The police had submitted a letter from the prosecutor general’s office to the court stating that Imran should be held in pre-trial detention, Zahir said. Zahir said the PG office’s letter stated that the investigation had identified reasons for prosecution. The police had already concluded its investigation and forwarded charges to the PG office. After forming an alliance in March with the main opposition Maldivian Democratic Party, senior members of the Jumhooree Party, and members of imprisoned ex-defence minister Mohamed Nazim’s family, Imran had been at the forefront of ‘Maldivians against tyranny’ campaign. 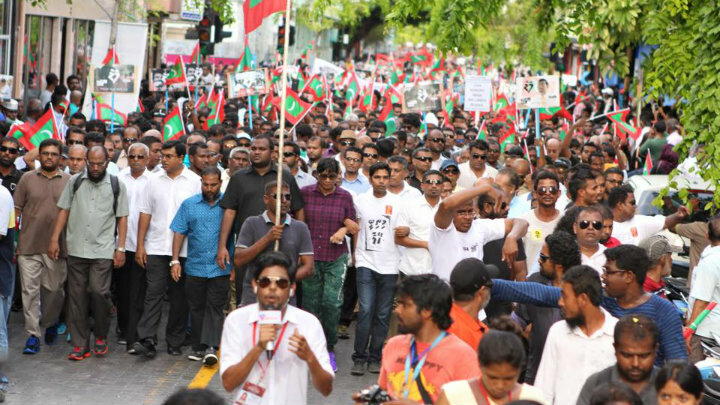 The May Day rally – the largest protest in over a decade – was the second mass protest staged by the opposition calling for the release of former President Nasheed and Nazim. Two weeks after the historic protest, President Abdulla Yameen extended official invitations for separate talks with the allied opposition parties. While the JP promptly accepted the invitation, the AP proposed Imran among its representatives and the MDP proposed imprisoned ex-President Nasheed. The government has also rejected Nasheed as the MDP’s representative for the talks as the opposition leader is serving a 13-year jail term and ruled out negotiations for the release of Nasheed and Nazim. The opposition alliance has meanwhile called for a third mass protest on June 12. 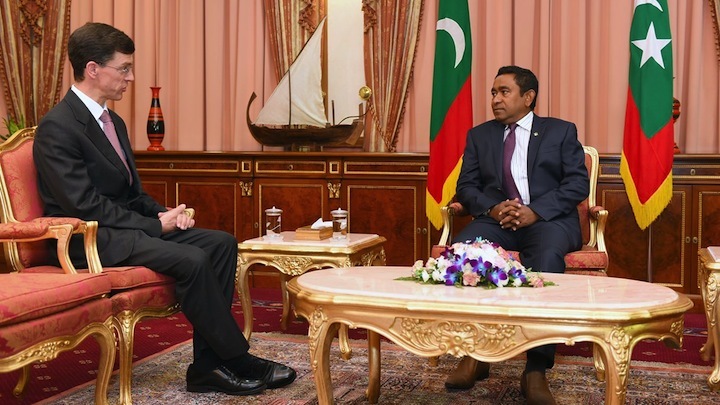 All political parties including the ruling Progressive Party of the Maldives (PPM) must sit down together for the talks between the government and the opposition, the newly-appointed British High Commissioner to the Maldives James Dauris has suggested. President Abdulla Yameen has called for separate talks with the three allied opposition parties – the main opposition Maldivian Democratic Party (MDP), the Jumhooree Party and the Adhaalath Party – to resolve the ongoing political crisis. “We think it’s important that talks involving all parties should take place. It seems to me to be logical that talks should take place involving all the parties together, both the party in government and parties in opposition,” Dauris said in an interview with Minivan News during a two-day visit to the Maldives. In his first visit to the Maldives since his appointment as high commissioner, Dauris presented his credentials to President Yameen on Monday and met leaders of the three opposition parties. Dauris said he shared the UK’s concerns over “the strength of democracy in the Maldives” with the president and spoke about the imprisonment of former President Mohamed Nasheed. “President Nasheed is a special interest because he is a former president of your country. The number of countries in the world with former heads of state in prison is small,” he said. Nasheed’s case is “emblematic,” he said, but the “wider concern” is over the judiciary. A judiciary that is “visibly and credibly independent” is essential for democracy to flourish, he continued. Nasheed’s conviction on terrorism charges in March after a 19-day trial drew widespread international criticism over apparent lack of due process and politicisation of the judiciary. The government yesterday rejected Nasheed as the MDP’s representative for the talks as the opposition leader is serving a 13-year jail term. The JP has meanwhile accepted the invitation for talks, but the religious conservative Adhaalath Party proposed its detained president, Sheikh Imran Abdulla, among the party’s representatives. Imran was arrested in the wake of a mass anti-government demonstration on May 1 and remains in police custody. 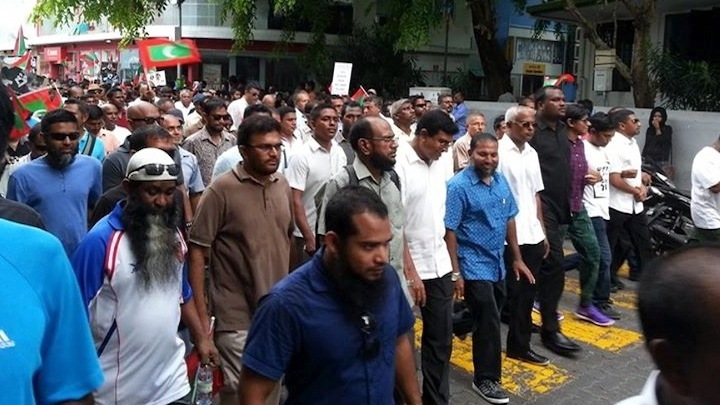 The May Day demonstration was the second mass protest staged by the opposition calling for the release of former President Nasheed and ex-defence minister Mohamed Nazim. However, the government has ruled out negotiations for the release of the pair – whose arrest in February triggered the political crisis – insisting the president does not have the constitutional authority to release convicts before the appeal process is exhausted. The opposition ‘Maldivians against tyranny’ alliance has called for a third mass protest on June 12. Dauris said the Maldives and the UK has “shared interests” in the areas of climate change, Islamic radicalism, and drug abuse. The Alliance of Small Island States (AOSIS), which the Maldives currently chairs, should be “ambitious in helping use its influence” at the upcoming climate summit in Paris, he said. “Islamic extremism is another shared concern we have. Like the Maldives, we have people in Britain going off to join IS in Syria, often going through Turkey,” he continued. He observed that the Maldives has “a relatively high number” of jihadis in Syria and Iraq. In January, the police said more than 50 Maldivians are in Syria, but the opposition says the figure could be as high as 200. Dauris was previously the British high commissioner to Peru.